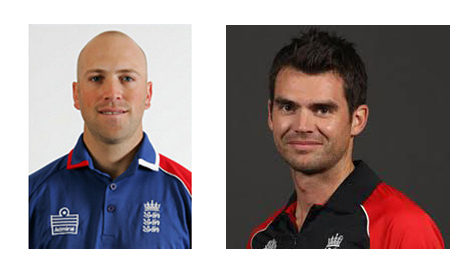 Lancashire and England fast bowler James Anderson and Sussex and England wicket-keeper Matthew Prior have followed in the footsteps of some of the leading names in sport by becoming ambassadors of the prestigious Desert Springs Resort in Almeria, Andalucía, south east Spain. Anderson and Prior have followed the likes of Sir Ian Botham, OBE, generally regarded as being England crickets greatest ever all-rounder, and double Olympic Gold medalist Daley Thompson CBE, one of the greatest all-round athletes the world has ever seen in giving their backing to the five-star Spanish resort. James Anderson is the fifth-highest England wicket taker of all time in Test cricket with 288 wickets in 77 appearances and is currently ranked sixth in the world Test bowler standings. Matthew Prior, the fourth-highest England wicket taker of all time has amassed 186 dismissals from 113 innings. He was the first England wicket keeper to score a Test hundred on debut, taking just 105 deliveries and hitting 16 boundaries after coming in at number 7, and finishing on 126 not out, becoming one of only 17 English batsman to record the feat overall.